One year, by pure happenstance, I had a dental hygienist appointment on Halloween. I left the office with sparkling, clean teeth and did not really have the desire to spoil that feeling right away. As a result, I consumed a lot fewer calories and was able to pass on the inevitable treats in the office that day. I stuck with the October 31 appointment for many years. It was a simple way for me to garner some extra willpower to avert temptation. While I don’t do it any more, today I find myself wishing that I did. Think about the events or situations where you need a little extra fortitude to get through. Is there something as simple as scheduling an annual appointment to help boost you? Buying the Halloween or Easter candy that is your least favorite so you aren’t apt to eat any leftovers? Making the item for the potluck that others find delicious, but you could easily pass up? In the office, you could schedule your toughest meetings at 11am to give people an incentive to wrap up for lunch. Maybe you bring a treat to the meeting to give everyone an unexpected smile (and glucose boost!) before you begin. Or you review a proposal with a colleague before the meeting so you know you are going in with an ally. There are many very small steps you can take to give yourself a pill of confidence. Think of it as a vitamin that you are intentional and consistent in taking daily. Before I moved to Iowa, I lived in St. Louis for seven years. During that time I became a huge Cardinals fan and have remained so today. My sister has lived in Boston for the last decade and even though she wasn’t a sports fan when she moved there, she has somehow gained an affinity to the BoSox. As a result of the extra incentive, there has been a rash of texts back and forth after every game. You can imagine what a field day (no pun intended) she had with the obstruction call. Yesterday I was getting texts about how her toes were getting excited. It has all been in good fun. The World Series will be over Thursday night, but there are always more sporting events or other occasions to engender a little ribbing. This type of friendly competition is good for morale and spirit in the office setting too. Pick a side, any side, and put some gusto into supporting “your” team. Even if you win nothing beyond bragging rights, it makes the journey to get there a whole lot more fun. Over the weekend, I spent some time outside cutting all the hostas and trimming back all the bushes in front of my house. In anticipation of our city’s Free Waste Day, we filled five lawn and garden bags with all the remnants of summer. If I look just at the yard, the bareness makes me question my motives. But if I look in the bags, I see the dead leaves and branches that were best removed. Often with gardening, the focus is on planting and growing, but pruning plays an equally as important role. Cutting things back often allows new plants to emerge with vigor. Come springtime everything will be fresh and able to bloom with much more space and intentionality. There is room for the new with the old out of the way. I think this analogy applies in organizations as well. Often we focus on adding and tending to what we have planted without regard to cutting back some of the initiatives. Maybe you would be well served to have a metaphorical Free Waste Day in your organization and see what you can toss into the bag. Maybe it is cleaning out a storeroom, purging old files, re-evaluating a program or revisiting an out-of-date process. Surely there is something that warrants some pruning. If you’re following baseball at all, you know that the Cardinals won Game 3 of the World Series on an obstruction call which allowed the winning run to score in the bottom of the 9th inning. The Boston Red Sox third baseman was on his stomach on the field as the Cardinals runner was trying to get by. Whether he intentionally was in the runner’s way or not was of no consequence and the umpire ruled it an obstruction, allowing the runner to advance. As you can imagine, such an obscure call at such a crucial point in the World Series caused a flurry of debate and doubt, but the call stands amidst the protests. The call overshadowed the brilliant catch to start the sequence of events and throw out the first runner at the plate, and if the Cardinals win the series it will live in infamy as the play that cost the Sox the title. It is unlikely that your organization has an umpire to make the calls and enforce the rules. But if you did, would you have received an obstruction call for how you have played parts of the game? Just as with the World Series call, intent does not factor into the decision. Even if it is an unfortunate circumstance, your actions can impede the ability of others to do their work as intended and that is defined as an obstruction. That leaves it to you and your people to play with integrity and make your work as fair as it can be. Be your own umpire and call yourself for obstruction if it’s warranted — even in the bottom of the 9th inning of the World Series. On Friday, we had 14 prospective student visitors in our office. That’s a lot for us in a day — each one requiring our visit coordinator to set up a tour guide, individual appointment with faculty in their major, a meeting with the coach if the student is a possible athlete and time with an admissions counselor. With 14 in one day, it involves a lot of juggling and logistics. About 2pm, a family walked in with a student and her friend — and no appointment. They were in town and happened upon our campus and thought they would stop in. Within 10 minutes, Viv had rounded up a tour guide and while they were seeing campus she set up appointments with a faculty member, someone from athletics and admissions. She made it all look effortless to the family, but it involved some scheduling heroics. And it also represented a true sense of our campus to those students. Even though it was late on a Friday afternoon and they dropped in unannounced, we made them feel special. We learned their needs and met them. We were genuinely glad that they stopped in. Not that I would wish more walk ins on our visit coordinator, but it is a great way for a family to peek behind the curtain and see what an organization is really like. How can you create an out-of-the-norm situation to test the mettle of a decision that is important to you? How would your service measure up in a similar situation? Anyone can put on a show. The real authenticity shines when you need something outside of the script. 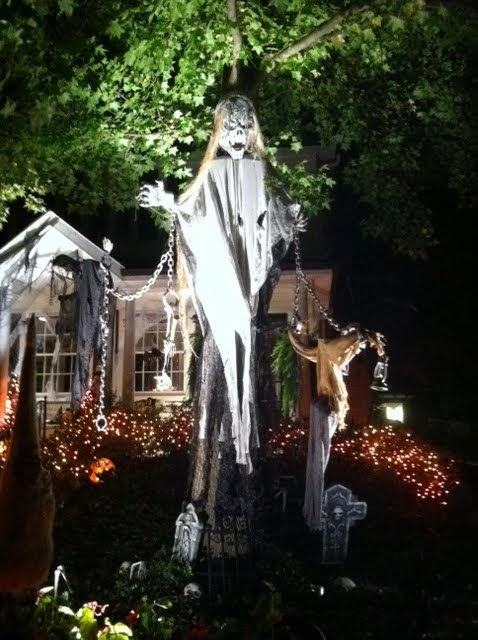 I wasn’t kidding that some people have taken Halloween over the top!!! When did Halloween become such a big deal? 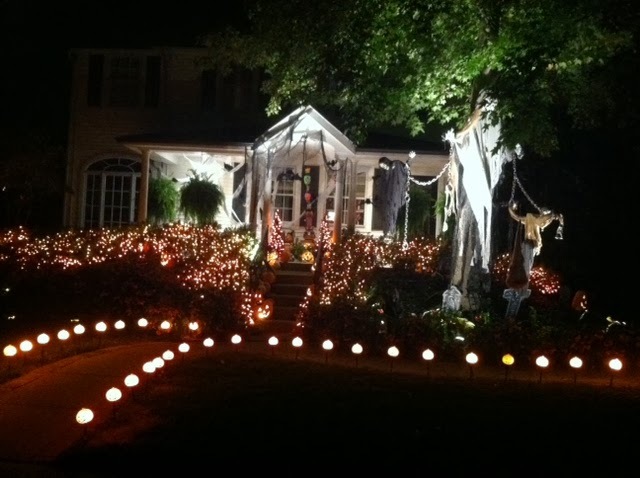 I feel like I am the only one in the neighborhood who hasn’t “decorated” for Halloween. Houses have giant blow up decorations that used to be reserved for Christmas but now feature black cats, pumpkins and vampires. Roof lines and windows are framed with black, orange and purple strings of light. There are decorations in the yards, windows, driveways and porches. Our town even had a Halloween parade. Forbes estimates that Americans will spend $6.9 billion on Halloween costumes, decorations and candy this year! It is the fourth largest holiday in terms of spending. Adult costumes contribute $1.22 billion in sales, children’s costumes $1.04 billion and the poor, poor pets are subjected to $330 million in costumes. Candy contributes another $2 billion and nearly that amount is spent on decorations. The amount I will spend on my costume: $2 (I found some cute little pumpkin earrings). Add in about $6 for candy, $8 for two pumpkins and I am done. Is there a Halloween equivalent for Scrooge? As you do your errands this weekend, don’t get caught up in the frenzy. Use your creativity and make your own costume. Buy a modest amount of candy. Carve a real pumpkin. Let Mother Nature add the color for you. Bob for some apples at home. Just because a holiday for kids has gone commercial, doesn’t mean you need to be bitten by the Halloween spending vampire as well.